Summary: Nisha was abandoned at the gates of the City of a Thousand Dolls when she was just a child. Now sixteen, she lives on the grounds of the isolated estate, where orphan girls apprentice as musicians, healers, courtesans, and, if the rumors are true, assassins. Nisha makes her way as Matron’s assistant, her closest companions the mysterious cats that trail her shadow. Only when she begins a forbidden flirtation with the city’s handsome young courier does she let herself imagine a life outside the walls. Until one by one, girls around her start to die. 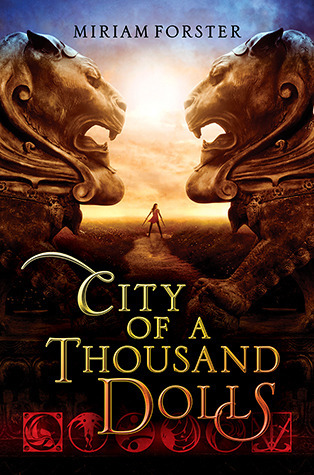 Review: City of a Thousand Dolls was a fun read, once I got over the telepathic cats. (The dust jacket does not mention that the cats can talk. I actually stopped reading so I could reread the dust jacket in case I had missed something.) The world of the Bhinian Empire is a fascinating mixture of Indian culture (with a Chinese-style two-child policy and some isolationist Japan vibes) and fantasy. The City itself—established so parents could drop off their unwanted girl children instead of killing them—is very much a lesser-of-two-evils establishment. While many of its inhabitants don’t fret much about the City’s purpose, Nisha and some of the other characters will at least acknowledge that training girls from infancy so they can be sold as courtesans, rich men’s wives, soldiers, etc., has definite skeeve potential. One minor critique (which could easily be leveled at books like Divergent or even the Harry Potter series), is that I think there are more available slots to humanity than just the seven presented in the novel via the Houses of Combat, Flowers, Beauty, Jade, Music, Pleasure, and Shadows (or Abnegation/Erudite/Amity/Candor/Dauntless or Gryffindor/Ravenclaw/Hufflepuff/Slytherin). Then again, Forster does offer some condemnation of both the City and the Houses through characters like Zann and Tanaya. One of the biggest flaws in this book is that there is a lot of infodumping. Sometimes the infodumping is strictly for the readers, but oftentimes Nisha gets a secret history lecture. While the latter is important for the plot, both forms are awkward and occasionally difficult to get through. Whenever the Bhinian Empire comes up as a discussion topic, be prepared to learn. The mystery itself is fairly good. While Nisha is not the kind of detective who would fit into a procedural or noir, she does the best she can with her limited skill set and resources. I was wrong about the murderer and the murderer’s motives, but I easily guessed several other important plot twists. (Protip: You ruin the mystery of whether or not the City trains assassins when they’re listed in the cast of characters.) I also felt that Forster cheated in a big way in the deaths of one of the girls—her death only happened in order to keep the mystery going. Honestly, almost all of the characters in this book are hiding something from Nisha. It didn’t vex me too much, but it will probably be infuriating for some people. Nisha’s romance with Devan is cute but is undercut by a lot of the City’s skeeviness. Much to my delight, this is explicitly acknowledged in-world (and gets contrasted with another relationship later on). Nisha is often competent and typically knows when she’s about to go in over her head. Of course, since she’s the heroine, sometimes she has far more bravery than caution, but that is far from atypical in a fantasy novel. Recommendation: Get it soon if you want a fun, quick read set in an India-inspired fantasy. There were a few too many missteps, particularly with the mystery, for me to recommend it whole-heartedly. However, there is a lot of potential in the world, and that means I’ll be back for the companion novel in 2014. What did you guys think about City of a Thousand Dolls? Do you have any similar novels you’d like to recommend?